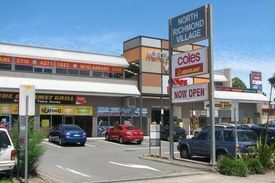 5 Commercial Real Estate & Properties in North Richmond are listed in 3 categories. We have 2 OfficesLease , 2 Retail ShopsLease and 1 ShowroomsLease . This boutique retail shop is located within the busy and successful North Richmond Shopping Village. You Get: Prime retail Maximum exposure High levels of trade through the Village Open Plan fit out Timber floors Air conditioning 99 customer parking spaces On site security and cleaning Flexible terms available. Great place for a hairdresser, barber, fashion.... All uses considered This is arguably the best space within the Village. Call now for an immediate inspection! This boutique retail shop is located within the busy and successful North Richmond Shopping Village. You Get: Prime corner position Maximum exposure Entry opposite Coles High levels of trade through the Village Open Plan fit out 99 customer parking spaces On site security and cleaning Flexible terms available. Food and Beverage considered. Great place for a hairdresser, barber, fashion.... All uses considered This is arguably the best space within the Village. Call now for an immediate inspection! Located in the busy and vibrant North Richmond Village, this first floor retail space is available for lease. Features of the space include: Fully partitioned office space Separate Offices, reception, storage Air conditioned Great natural light Large Window Display Signage opportunities Loads of natural light Private kitchen and shower Located in a shopping Village with the likes of Coles, Gloria Jeans and other excellent tenants. On site parking for 99 Cars. Flexible terms offered Previously used as a dental studio, this property is suitable for a variety of uses. Can be combined with adjoining tenancies to create up to 350 sqm A must to inspect! Located in the busy and vibrant North Richmond Village, this first floor office space is available for lease. Features of the space include: Open Plan Large Window Display Good exposure/signage Well maintained building Loads of natural light Open Plan Space Flexible Terms Located in a shopping Village with the likes of Coles, Gloria Jeans and other excellent tenants. On site parking for 99 Cars. Flexible terms offered A must to inspect! Located in the busy and vibrant North Richmond Village, this first floor retail space is available for lease. Features of the space include: Open Plan Studio Space Separate Office/reception Large Window Display Solid levels of passing Trade Loads of natural light Open Plan Space Flexible Terms Located in a shopping Village with the likes of Coles, Gloria Jeans and other excellent tenants. On site parking for 99 Cars. Flexible terms offered Previously used as a dance and fitness studio, this property is suitable for a variety of uses. A must to inspect!